... on the road with you to connecting faith, church, and home in this journey we take with God. We want to communicate with you in all kinds of ways and so our postings will be many and varied! We do offer a weekly children's sermon and monthly Time Together devotional on a regular basis. You can find those through the archives as well as the Children's Sermons and Resources Tabs. We hope you will leave your comments and contribute to the networking of this site! 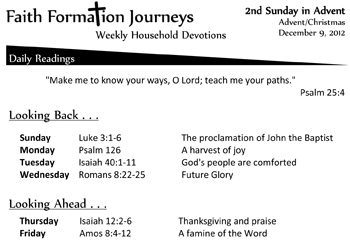 Come check it out, we will be posting all of our Children's Sermons, Weekly Devotions, Monthly Faith+Home connections and more on our new site from now on. Thanks for all your support and encouragement, we look forward to continuing to provide tools and resources for our ministry together. Faith +Connect: What is love to you? This week in our Bible stories we hear about how much God has loved us-all people from the very beginning of time. When you love someone, some place or something you want to be with that person, that place or that thing (like a doll or blanket) all the time don’t you? Well God also wants to be with us and everyone all the time. And God wants us-all of God’s people whom God loves-love to be together too. We hear in Luke 1 a blessing from Zechariah-John the Baptist’s father-to his son John, and the blessing is that John will tell the world about God’s love and that God will make all of us peaceful with one another. How can we show our family, brothers, sister, neighbors God’s love and peace? Each of you will get this candle ornament that you can take home and color blue (or purple if you do purple in Advent). You can hang it on your Christmas tree and each week you will get another one to add to the tree. So now you will have two. On the back is a Bible passage from Luke 1 to read, a prayer and a blessing. You can do this at dinner, in the car or before bed. Let’s practice it now! Faith +Pray: God of Hope, you free us from whatever keeps us from you. Thank you for being with us always, amen. Notice something different about on the back page? Dinner Devotions are now called "Faith on the Go!" 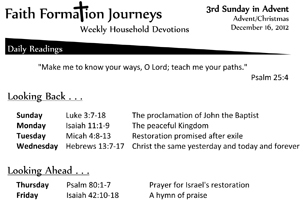 It's the same great household Bible study, but formatted to work with "Faith Five" from Faith Inkubators. Gather the children to the Advent wreath. Say, “Does anyone know what day today is in the Church?” Accept all answers. Today is the first Sunday of Advent. We are gathered here at this wreath with candles on it, we call this an Advent Wreath, and we are going to light just one candle today. Each week of Advent we will light another candle until all of the candles are lit. How many candles do you see here? That’s right four! There are four weeks of Advent; four weeks until we celebrate Jesus’ birthday, Christmas. We light a candle to remind us that Jesus is the light of the world! Did you know that each candle has a name? This week’s candle’s name is the Hope candle. What is hope? Accept all answers. Hope is expecting something wonderful to happen. We know that something wonderful happened when Jesus was born and also when Jesus died and rose again. This wonderful thing is that God loves us so much and we expect God to be with us always because God promised this to us! Nothing keeps us from God and we are free to love God and everyone around us! Each of you will get this candle ornament that you can take home and color blue (or purple if you do purple in Advent). You can hang it on your Christmas tree and each week you will get another one to add to the tree. On the back is a Bible passage to read, a prayer and a blessing. You can do this at dinner, in the car or before bed. Let’s practice it now! God of Hope, you free us from whatever keeps us from you. Thank you for being with us always, amen. As you distribute the ornaments with the devotion on the back, have them sing "This Little Light of Mine" as they go back to their seats. Gather either around or near your tree! Share where you see God at Advent & Christmas and where you need God at Advent & Christmas. 12let the field exult, and everything in it. Then shall all the trees of the forest sing for joy13before the Lord; for he is coming, for he is coming to judge the earth. He will judge the world with righteousness, and the peoples with his truth. How can the Christmas tree remind you of the story of the birth of Jesus? How will it bless you in this Advent/Christmas season? How will you be a blessing to others? Pray: Join in prayer together thanking God for where you see the Holy Spirit active and asking for help in where you need God this year. Blessing: Loving God, we come with joy to celebrate the birth of Jesus Christ, whose path of justice and inclusivity lights a path for all who follow him. May this tree, arrayed in splendor, remind us of the life-giving cross of Christ, that we may always rejoice in the new life that shines in our hearts. In Jesus’ name. Amen. May use with permission for non profit only. Intellectual property rites apply. "Faith 5" icons from faithink.com used with permission.